So I got the answer to the question that has been bugging me for all this time. If the system is the one that learns, then what should we be teaching? So, to put it differently If there's an app for everything, then what do kids still need to learn"
And the answer? They need to learn how to put it all together. The solution: CODING. Victor Ngubeni stated on Facebook that he had just completed the Hour of Code. So I thought it was a good idea and shared it on. Then Niret Grobler commented that it was Awesome. So I thought I might try it too. And was it AWESOME. In one hour I played "Angry Birds" and programmed a Zombi to eat a Sunflower. I earned six "Mastery Trophies" and this beautiful certificate. I learnt how to move, turn, repeat, use an "if" statement, and use an "If then" statement. I intuitively understood for the first time why the "Go-to" statement is harmful, and I learnt a whole lot about my own behaviour as a learner. In the process I interrupted myself two or three times to read WhatsApp messages from home (I am in Alaska for the #HETL14 conference) drink, coffee, etc. So, I learnt so much about 21st Century learning. Click here to suggest other characteristics. I have never studied computer science. 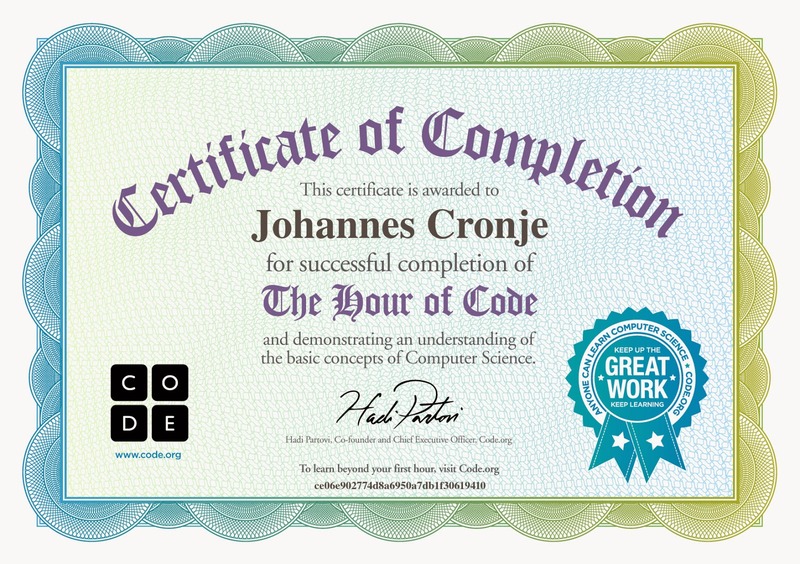 In 1983 I did a six-hour course in programming a Commodore 64 in Basic. Yet those little bits of skill were enough to help me understand the logic behind just about every device I have ever had to interact with. It made it easy for me to understand the concept of writing macros in Word or to create spreadsheets in Word and finally it helped me understand how to use IFTTT to navigate the maze of apps on my phone and to get them to work together. The problem with the Rhizome, is that it is a maze. It has many many branches, most of which lead you nowhere, but many of which lead to aMAZING results. And the point with programming, as is pointed out by the introductory video of The Hour of Code, is that it allows even a robot to navigate a maze. So in our multilingual world and our multi-device world there is one language that we all need to learn to write - the language of code.